It is no secret that I love fall. The colors, the cooler weather, and everything that comes with it. I started with fall themed reading even before the weather had turned. Sitting down with a good book is my favorite way to relax and let my mind wander at the end of a long day. And it beats so much of the stuff that is on TV! Here is what I’ve been reading the last couple of weeks. You know how sometimes you’re super excited for a book and it just wasn’t everything you’d thought it would be? That is how Hallowe’en Party was for me. 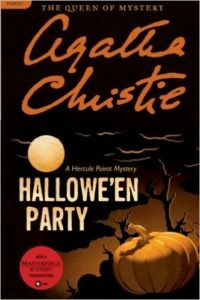 I’m a big Agatha Christie fan and usually enjoy a good Hercule Poirot story, but this one just wasn’t one of my favorites. This book wasn’t written until 1969, towards the end of Agatha Christie’s writing career. I don’t know if that had something to do with it, but it wasn’t one I’ll need to reread anytime soon. 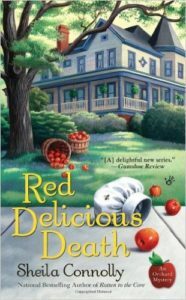 This is the third book in Sheila Connolly’s Apple Orchard Mystery Series. Every time I pick one of these books up I keep thinking I need to make one of my favorite apple recipes in the spirit of the book. It hasn’t happened yet, but maybe on book four. This was a fun installment in the series and leaves the reader with a bit of a cliffhanger at the end. I’m sure I will be reading the next installment soon. I have read other books by Kingsbury and when I saw this one was being offered free on Kindle, I just couldn’t resist. 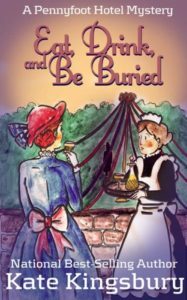 It is a historical cozy mystery series and follows Cecily, the owner of the Pennyfoot Hotel through her adventures of inn keeping and amateur sleuthing. I enjoy that Cecily is older than your traditional cozy mystery protagonist. Her husband has recently passed away and her children are grown and out of the house. It creates a different array of problems and struggles than you see in so many books of this genre. This is a series I’m reading out of order. I read the most recently published installment, Murder Most Howl, earlier this year. And when I saw there was a Halloween themed book in the series, I had to check it out. This series is great for any animal lover. It follows Holly, who helps her grandmother run a pet friendly Inn. I loved the Halloween imagery that flowed through the entire book. It didn’t just tell you the story took place in October and leave it at that. 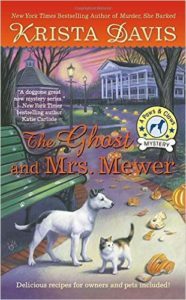 If you are looking for a book to really get you into the Halloween spirit, this is a fun choice. This book also part of another fun idea that I can’t wait to share with you. Details coming soon. What are you reading? Do you tend to read books from the season that we are currently in? Leave me a comment below and let me know! PS – This post contains affiliate links. That’s just a fancy way of saying that if you purchase anything from Amazon after clicking on one of my links, I’ll get a small percentage back. This is greatly appreciated and I thank you for any purchases you make through a link on this site! We Survived the First Week!